Follow these easy steps to learn how to add a drop shadow to text in Photoshop. This can be applied to any raster or vector object in Photoshop as well as type. Create a new document and select the type tool from the toolbar. Also choose a colour to use by clicking on the colour swatch at the bottom of the toolbar. Draw a rectangle on the canvas with the type tool from top left to bottom right, and type the word or phrase you wish to add the drop shadow to. Use the Character panel, to change the font and size of the type. There are 3 different ways of acessing the drop shadow panel, this is just personal preference for which you find easiest to use..
A)Double click the layer with the type on it in the layer palette, a panel will appear where you can choose drop shadow from the left hand menu. 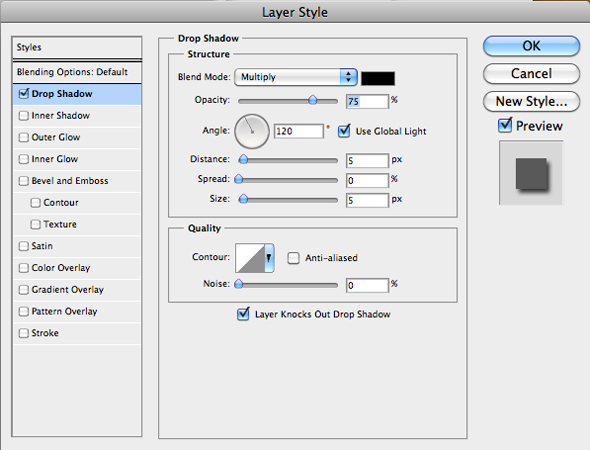 B) Select the type layer then click on the fx icon at the bottom of the palette and choose drop shadow from the menu. C) Go to Layer > Layer Style > Drop Shadow. If you move the panel to the side so that it’s not covering the canvas (just click, hold and drag the panel by the top bar) you will see that you already have a preview of what the drop shadow will look like on your lettering. Click ok to close the panel once you are happy with the drop shadow settings. The text is still editable so you can amend the text and apply other effects after you have applied the drop shadow. The example below shows the last drop shadow example from above but with the text the same colour as the background. thank you so much it helped a lot!! Thank you so much for this tutorial! It really helped me put a dropshadow in my Fantastic ART.